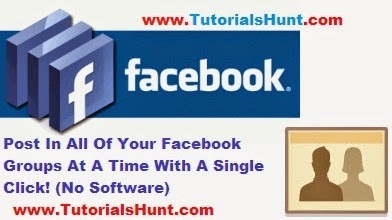 Home Facebook Tricks How To Auto Post In All FaceBook Groups With A Single Click? How To Auto Post In All FaceBook Groups With A Single Click? Note: Use any of the above scripts.I have mentioned two because if one stops working you can use the second one.You just need one script to auto post in facebook groups. Also Read: How To Download Anu Facebook Album Quickly? NOTE: Please use this script only two times a day otherwise it will get banned from your Facebook profile.You will have to carefully use this script.It’s features are awesome! You can post in all groups including your timeline for free.If you have any other script you can attach it in a message and then forward it to us via our Facebook page.Bad thing is that you cannot attach an image in the post but dont panic I am working and I will release that trick soon.I will also share how you can add all friends in a Facebook group at a time,with a single click! If this script stops working then please comment so that we can update it immediately. Thanks, for watching the video tutorial we hope that you would have liked it now please comment to appreciate us and dont forget to share this post with your friends..!!! Remember me in your prayers..!! We are eagerly waiting for your response! It will be nice to hear from you. Thanks, Buddy for appreciating our work keep viewing our site for more tricks and please share it with your friends..!! Bro ap browser change kr k dekho…aur dobara tutorial dekho k kahen ap ghalti tu nahi kr rahy….ager pher b prob aata hi tu mujhe error btao aur yeh b btao k vo error kab aata hi I wiil try my best to help you..!!!!! Thanks, works like a charm. Is it possible to show an Image on the post. Thanks for appreciation……no It is not possible to sow image on the post using this script……Soon I am gonna create a Facebook Auto Group Posting application…..using that you will be able to attach an image in post…..I will share it when the app is ready..!! Keep viewing our site and dont forget to like our facebook page for more tricks..
Bro is ko use krny sy i.d to block nhi ho gi? or kya is sy video ka link b post kr skty hen? Bro if you will use this once in 2 days that would be fine otherwise you will be blocked and yes you can share video link too.Any link..! Wah.. Thats Awsome….Thanks for it bro…. or dear i also have a 2 question… groups py pictures kesy send keya ja sakta hy.. and .. is method kor har bar repeat krna hoga.. This site is best for bulk marketing work on internet but after posting scripts, facebook blocks the id. Please do some resolution of this problem. Your profile gets block only because of excessive use.I recommend you guys not to use this script more than once in a day! No you did’nt do anything wrong.Actually its problem with the script.I have tried many scripts but this problem is common in them too and yet I havent found a solution for it! Try software or comment your problem in detail! I am having trouble, my account logs in but when i go to make a message and scadual a post, none of my groups show up. It might be due to your privacy settings! Make sure you allowed app to access your account completely. Thank you so much … the end I found the answer to my search so far.